Between my cabinet shop and remodeling company, I have the opportunity to work on a lot of fun and challenging projects. I recently tackled a project in which we converted a home office into a master bathroom. The interior designer on the project threw us a real curveball—(almost) literally! The soaking tub in the plans called for custom paneling, and the location of the tub in this bathroom had a real impact on the space (hence the evolution of the design). The paneling started out square (no problem), and then became a very gentle, shallow curve (again, not too big a deal), and then the tub became an ellipse (game on). I’d never done this type of work before, but I’ve read a lot about it, and I watched a friend make some curved panels for an oak living room last year. Sometimes you just have to jump in and do it, trusting that your knowledge and experience will get you through. That’s basically what I did! I thought I would share with TiC readers what worked and what didn’t. I don’t have the designers’ drawings to post here, but it’s basically a curved frame and panel (five equal panels) about 20 in. tall following the front of a tub. Whenever possible, I like to make full-scale layouts of what I’m building. In this case, a full sheet of plywood fit the bill. I was able to draw the required ellipse by measuring the major and minor axes from the tub template supplied by the manufacturer. My plan of attack was to make the plywood tub deck first, and then build the walls under the deck. The wall would then serve as the base for the paneling. It would simultaneously be the form for gluing the curved rails and moldings, as well as the framing for installing the entire piece. There are many ways to draw an ellipse. I’ve used the string method before, but I was looking for a more exact method. At one point, I was shown one method of laying out a track and using a trammel arm with pins (see photo, below). This technique is very similar to the the router setup Mike Sloggatt used in his article on the ellipse. Using the drill press and a 1/4-in. drill bit, I first drilled a hole for the pencil (I tapped the first inch of the pencil through a steel dowel plate to make it 1/4 in.). I drilled a second hole for a 1/4-in. dowel the length of the semi-minor axis away from the pencil. I drilled the third dowel hole the distance of the semi-major axis away from the pencil. The dowel representing the semi-minor axis rides in the long horizontal track, and the dowel representing the semi-major axis rides in the vertical track. The first step after making the trammel arm was to draw the center lines along both the lengths and widths of the sheet. I then brad-nailed some thin rips of poplar to the plywood, keeping the center lines in the middle of the track and making the track the thickness of the dowel I was going to use in the trammel arm. I could have used the dowel itself, but I risked creating a wavy track by nailing the poplar strips at points along the line. Instead, I marked a line parallel to my center line, and half the thickness of my dowel. I nailed one side of the track to that line. I then used my calipers to gauge the exact thickness of the dowel and milled a rip of wood with the thickness planer until it was exactly 1/64 in. thicker than the dowel. I used that longer strip as a spacer to ensure that the second poplar strip was perfectly parallel to the first. The extra 1/64 in. allowed the dowels to move smoothly. A little wax in the track helped as well. The most important point to keep in mind during this operation was the center line. You’ll see the importance of this as the work progresses. Unlike a circle, when you shift a molding over the face of an ellipse, it no longer follows the form, and you end up with a gap. Every part was laid out along the center line throughout the project to make sure they all followed the changing curve of the form. I then used my go-to method for routing curves with AZEK. I’m always scavenging rips of AZEK from job site dumpsters to use in the shop. With a little help from a heat gun, and an extra set of hands, I screwed the AZEK to the plywood following the curve. I cut the waste with the jigsaw, and finished the cut with a router using a bearing-guided bit. I now had a full-scale pattern for the tub top. I made the wall plates from the top pattern with the same router and bearing set-up. The walls were simple studs screwed to the curved plates. …and one layer of 1/8-in. Italian bending poplar plywood—glued and stapled outside of the panel layout to the first layer. I had to be careful not to over-tighten the screws, because over-tightening created flat spots, as the plywood followed the 1 1/2-in. flat face of the stud (I didn’t shape the edge of the stud to the curve of the plates). One problem with forming curves is keeping the pieces from “twisting” and walking off of the line of the curve. To help everything “stay put,” I screwed blocks along the top of the wall to make it easy to follow the curve. The next step was to make the rails. …and sent them through the planer using a piece of plywood on the bed of the planer to keep the planer from chewing up the thin pieces. I had to do a trial run to make sure the pieces were thin enough to follow the curve without cracking or curling up on the edges. Four plies at 1/8 in. worked well. I could have gone to five plies, but I probably would have lost a few more pieces to the planer. A wide belt sander, which I didn’t own at the time, would have made that easier. I needed two rails, but made enough pieces for four rails. I then cut up the extra rails for the cove moldings. The first challenge was gluing the curved rail pieces. I thought I had an easy method using a large band clamp. This always works for gluing fully round objects. However, as you can see from the pictures, it didn’t apply even pressure—there was almost zero pressure on the top. The band itself was under tension and not even applying any clamping pressure onto the veneers. But you can see there was good pressure on the sides. In the past, I always made a positive and negative form with smaller curved pieces. This piece was too big for that method. A friend of mine made curved rails out of oak, cutting them into pieces and then adding the hinges. I figured I’d take a cue from his experience. It’s a slippery nightmare to work with four thin layers of poplar covered in glue. The hinged form, and an extra set of hands, gave me the time to start clamping at the middle and slowly work the form and clamps along the curve, keeping the pieces aligned at the same time. With only one form and clamping caul, this was a very slow process. It took seven days to make five rails and two pieces of baseboard (one for baseboard, the other for the top molding). To form the baseboard in a different plane from the rails (which changes the radius), I glued it up with a piece of the rail between the base and the form. There is always a big concern about what type of glue to use when working with curved pieces. The answer I always give is: “it depends.” Concerns often include springback, joint creep, open-time (or set time—you do need extra time when gluing curves), and weather resistance (think of a curved exterior railing). The different properties of the different glues address these issues, well, differently. That’s why it depends. Instead of getting into a discourse on the subject (which is worth another article), I’ll just say that I used good old Titebond III. I wasn’t concerned about springback, because every part was going to be nailed or screwed to the framing, and the parts were thin enough that it wasn’t going to be a fight to get them back to following the form (see photo, left). The clamping caul I built had to follow the tub radius at a 1/2-in. distance from the tub (the thickness of rails I was making). I made the form using a 1/2-in. pattern bit in the router. I followed the outside layer of the plywood on the tub, routing another piece of 3/4-in. plywood. The off-cut from the piece I routed became the pattern. I then used that piece as a pattern for my form. I had to make four pieces of 3/4-in. plywood for each section of the form. When it came time to make the baseboard pieces, I took the form apart and routed another 5/8 in. off of the form because the baseboard was 5/8 in. thick. I also had to make a few more pieces for each section because the baseboard piece was wider than the rails. I used 3/4-in. plywood because it was a good use of all the scrap pieces leftover from cutting the curves out of the full sheets of plywood. Once all the parts were glued, it was time to put them together. …and then run through the thickness planer to finished width. I was able to easily layout the stiles on the tub base itself with the FastCap flexible/flat tape measure. Locating the rails on the center line (the most important layout line), I transferred the stile locations to the top and bottom rail. The stiles were milled to thickness from solid poplar. The flat back of the solid stock rocked a bit on the curve, especially at the tightest part of the radius. I used the curved blade in the Festool power plane to solve that problem. One pass, and the stiles sat flush on the back. I used my trusty Lamello biscuit jointer to join the rails and stiles. I could have used the Domino, but I wanted to have a glued spline along the entire joint. Once glued, the edges of the flat stiles stuck up slightly proud, as they didn’t follow the curve. I used a sharp block plane and curved sanding block to quickly shape the stiles to the varying curve of the rails. Once I glued the rails and stiles, and attached them to the tub base (see photo, below), the next step was to make the panel molding—a simple cove that would be glued and nailed into the panels. Going into this project, I imagined this would be the hardest part. It turned out to be the simplest! Because the radius of the curve changes along the length of the ellipse, the moldings in each panel would have to follow a different curve (which is what made me think this would be such a difficult task). By making the moldings out of one of the extra pieces I glued, I was able to overcome the issue of the changing radius. I cut the extra rail into five sections, which corresponded to each of the panels. Then it was a quick three-step process to make each molding. Having two routers set up was essential. I first routed off the outermost ply of poplar with a rabbeting bit. Next, I routed the cove. I finished the piece by ripping the molding piece to width with the bandsaw (notice the labels on every piece). One, two, three elliptical moldings—that was easy! Because the moldings were so small, cutting them to fit was very forgiving. I cut them with my small miter saw (Makita 7 1/2-in. slider) using a wooden subfence for support, holding the piece so the fence was tangent to the point of the cut. That was accurate enough. It took a few cuts for each piece to nibble down to a perfect fit. The extra time was cheap insurance for not having to make more moldings. The vertical pieces were straight runs of molding—I just had to hand-plane a slight bevel on the edges to keep the edges of the molding tight to the panel and rail. Once all the pieces were cut to fit, I glued and brad-nailed them into place. To finish off the shop work, I profiled and attached the baseboard and top trim pieces. I then sent off the entire piece to the finisher for painting, and finally brought it to the jobsite for installation. And yes, it did fit through the door and up the stairs! Installation was straightforward. I had checked the floor for level with a laser before I built anything, so I knew that shimming to level wouldn’t create any new problems. 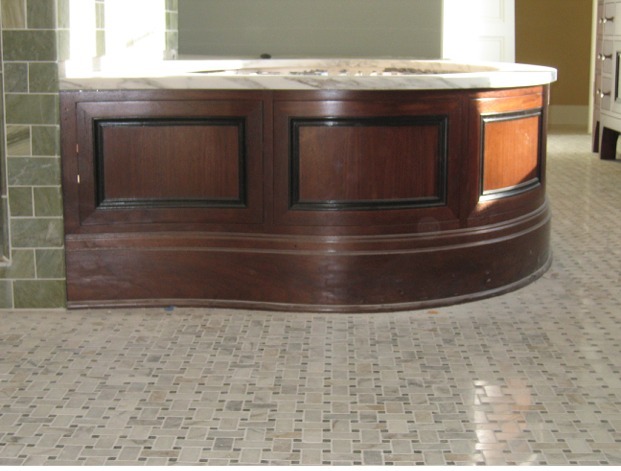 The floor was to be tiled; as long as the piece wasn’t shimmed more than 3/8 in., the tile would cover any space between the bottom of the panel base and the subfloor. The only detail that still bothered me was if the tub fit and the curves lined up…which they did. I never made it back to the house to see the completely finished room, but here’s a look at the tub right after installation. After my first design/build project—a toolbox completed at the ripe old age of six—I took a leave of absence from the trades to explore other avenues. It wasn’t until after college—four years at Georgetown—that I rediscovered the urge to build. My Jesuit education, with its emphasis on serving those in need, pushed me towards Americorps, building houses with Habitat for Humanity in the inner city of Washington, DC. After two years, I moved back home to southern Rhode Island and began my journey in the construction trades. I worked for several years building entire houses in a development, learning about all the phases of frame-to-finish residential construction. An affinity for finish carpentry led me on the path to custom building, where I am today, 17 years later. I am currently a partner in DeMetrick and Borge Housewrights, a residential contracting company specializing in high-end remodeling. I also run a full-service cabinet shop specializing in furniture grade cabinetry and meticulous interior millwork. I am also a closet building scientist, and I just earned my BPI analyst certification. I’m always looking for an opportunity to spread the good word about air sealing and the proper use of vapor barriers. Outside of work, I am devoted to my lovely wife and spending time with our four great kids. When the kids are sleeping, I can be found fishing for striped bass along the Rhode Island shoreline. Life is good. nice work, and a great write up! Very Impressive; Did you do this T&M or lump sum bid? If it was a bid, did you make you wages? We had a contract for the entire remodel of the bathroom and the tub panelling was an “allowance” item that covered the cost of straight panelling in front of a square tub. When the scope of work changed to what you see here we reviewed the extra costs with the owner, giving them an approximated overage cost on the allowance item. In all honesty, I had no idea what it was going to cost to build because I had never done anything like this before and for that reason the estimate I gave was just a wild guess. In the end, I made a modest wage with the only profit being the experience gained from completing the project. It was worth every penny lost and learned. It’s refreshing to see an attitude that isn’t “bottom line is everything”. Yes, we need to make money so we can buy groceries, pay the mortgage, invest in new tools, etc. But, based upon your response above, you see the value of growth as something to invest in as well. Kudos. Believe me, there are many days when I wish I was more focused on making money. I look at jobs like this as the apprenticeship that I was never able to find when I first started out. In completing this project I learned more and became a better carpenter than when I built my last five kitchens. That’s kind of the idea/theme I was trying to communicate when I wrote about “jumping in and trusting your instincts”. On the flip side, I just made very good money building a curved range hood for my last kitchen using a lot of what I learned here, both skills and confidence. Lots of work, you make it look easy! The only thing I would have enjoyed more is seeing the piece stained. I once did seating in the round in a small chapel. I went through some of the same thought processes you did. Keep up the good work. Nice work! I did one of these years ago. Sorry I din’t take pictures. I used the pattern that came with the tub to layout the deck- mahogany planks joined with biscuits. My walls were the same framing as yours, covered with 2″ bead board vertically to follow the curve and finished with flex moulding. The deck was finished with marine-grade poly, the bead board and trim were painted. The customer was very happy! Sweet and well executed…looks like it was a fun project too. I really like the trammel jig you built. Gives me ideas for my on site builds that I do so often. Keep up the great work! I had an opportunity to help on a similar project for an omega shaped tub out of walnut with concave and convex panels, rails and trim. A great learning experience. That’s gorgeous. Did you laminate the curves or cut them from solid stock? I haven’t done any stain grade curved work and was wondering how the laminations show in the final product vs. exposing the end grain as you saw the curves from solid stock. Let’s just say I’m glad my first one was paint grade. Awsome job! I would like to note a major saftey issue though: I see you are wearing gloves while using your router table, this is a huge concern if for any reason your glove gets caught you will be minus a finger, or at least a mangled one. Be safe! I know what you mean about loose clothing around power tools, it can be a recipe for disaster. I often wear a tight fitting pair of rubber coated gloves when milling wood with the router table, jointer, etc. I’ve since found a better version that fits even tighter to the hand. I feel the improved grip on the material leads to a better and safer cut. Push sticks and feather boards are always my first choice, but not feasible with every operation. Thanks the great article. Beautiful work. The panels and the rails were laminated in place on a mock-up stud walls. The dark finish made the laminations blend in pretty well. The rails and trim were shaped on contoured sleds. Absolutely great job! Did biscuit joining the rails and stiles present any problems. By that I mean did the base of your Lamello rock on the bent plywood enough to cause any trouble lining up the biscuit grooves? Thanks. I really appreciate the great feedback! On the flatter part of the curve it didn’t matter, but on the tighter radius I taped some shims to the bottom edges of the jointer. It also helped having the Top 20 Lamello because I could dial the blade to cut 2mm lower, which made a difference in the thin stock. “Domino if you wanted to”… most of us don’t have these luxuries. Years ago we would have used our scout knives and whittled the damn thing out of a single tree trunk. Looks like nice work though! Great Job!! Curved work allows you to think outside the box. Since the project was paint grade, did you consider building the project using PVC? It seems that you would have an easier time with the bends using heat. Also, painted projects, unless they have a factory finish don’t hold up that well to a wet environment. But I doubt that tub will see daily use. The down side to PVC, besides not being wood, would be if they have electric heated floors that get hot for morning use, might create some quick expansion and contraction. Love the craftsmanship. Work like this is many times under appreciated especially by contractors and owners who don’t understand the time it takes to do it right and provide a great piece of furniture/millwork like this surround.